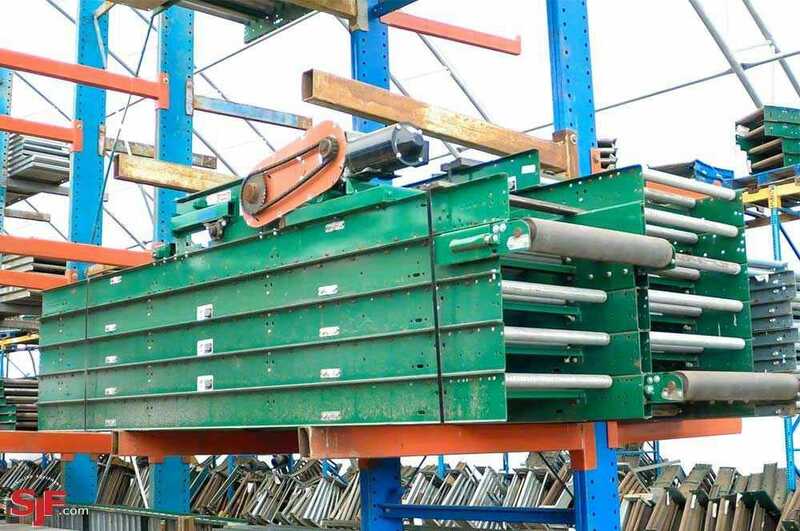 What is Belt Over Roller Conveyor? 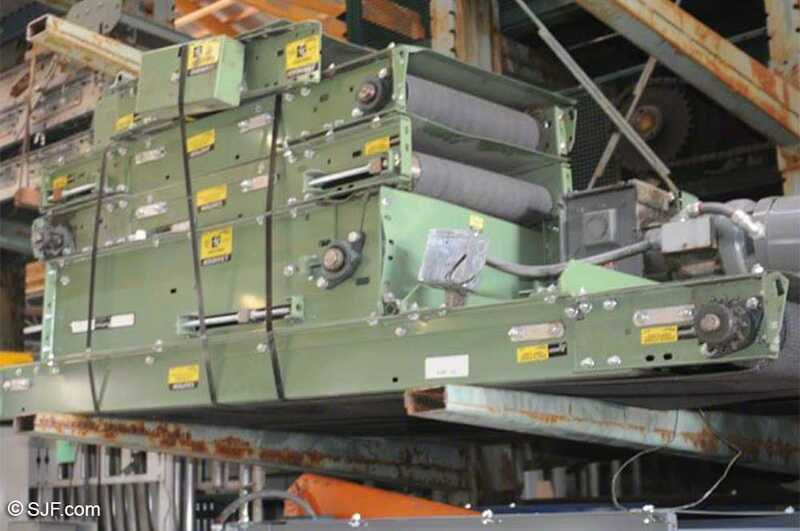 Powered belt over roller conveyor provides much control over the orientation and placement of loads, which can be good for bulky, irregularly shaped products. 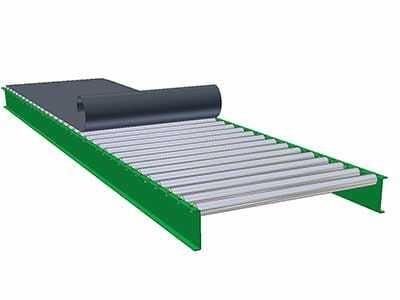 Because product orientation is easily controlled with belt over roller, it also makes a good conveyor to use in induction and sortation conveyor systems. 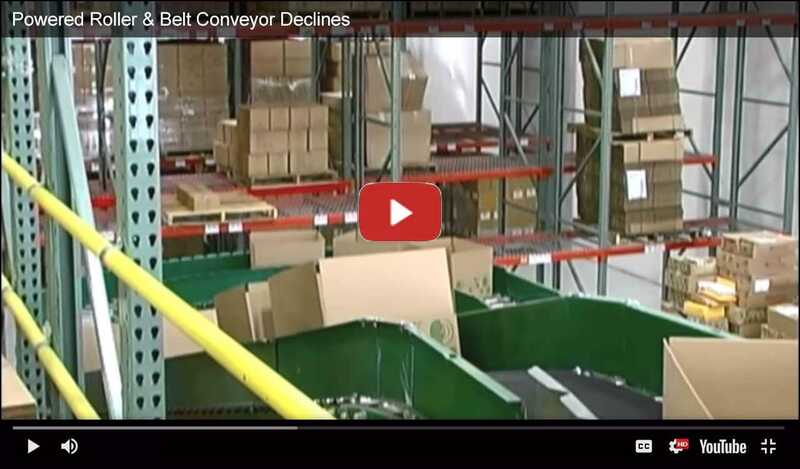 The video above demonstrates how a powered belt over roller conveyor decline is utilized to move boxes to a lower level. *Stands available but not included. Please call for pricing. 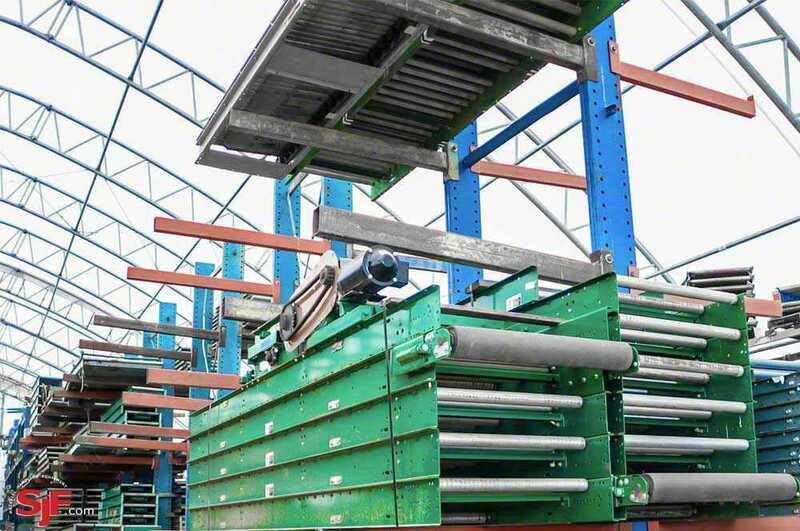 This industrial rubber belt conveyor was purchased in good condition and is currently in-stock and stored indoors at SJF's main facility in Winsted, MN. 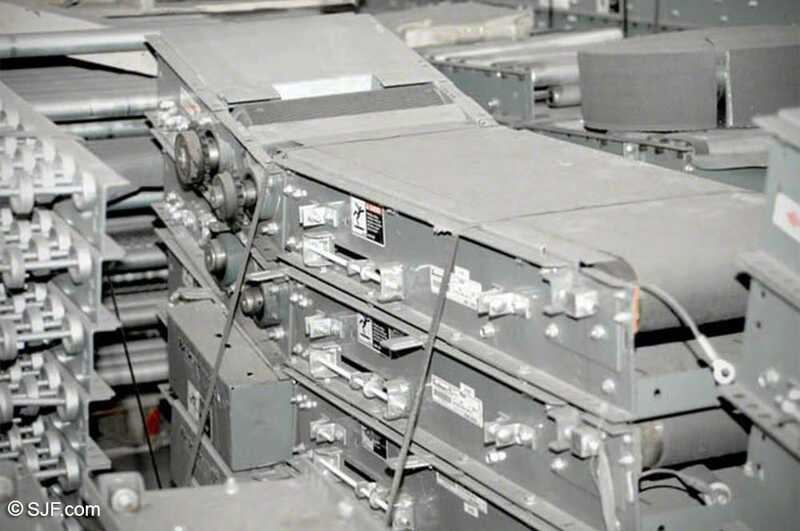 We also have several used belt conveyor curves and drives that have recently arrived that are not currently listed here. 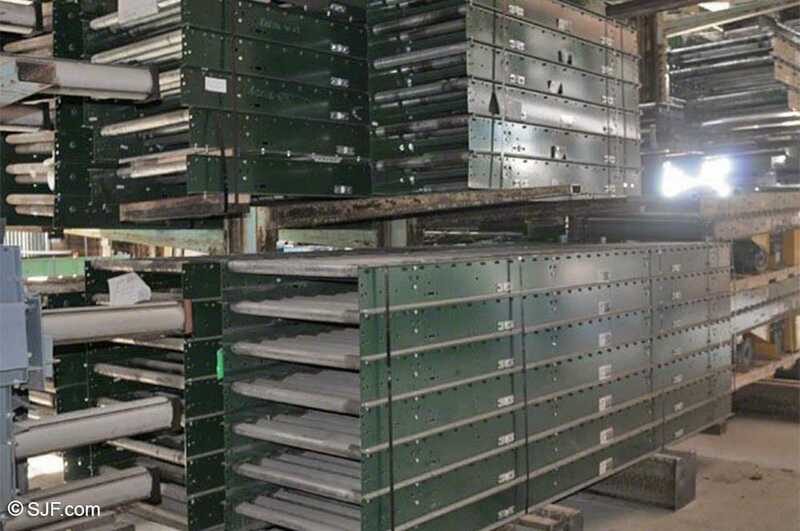 Component items SJF currently stocks include adjustable conveyor stands, used conveyor belts, air take-ups, conveyor belt cleaners, conveyor belt fasteners, conveyor belt scrapers, rubber conveyor belts, guardrails, conveyor belt tracking devices, idlers, conveyor belt systems and more. Rapistan Dematic 24.25" BOR, old style $25.00/ft. $35.00/ft. 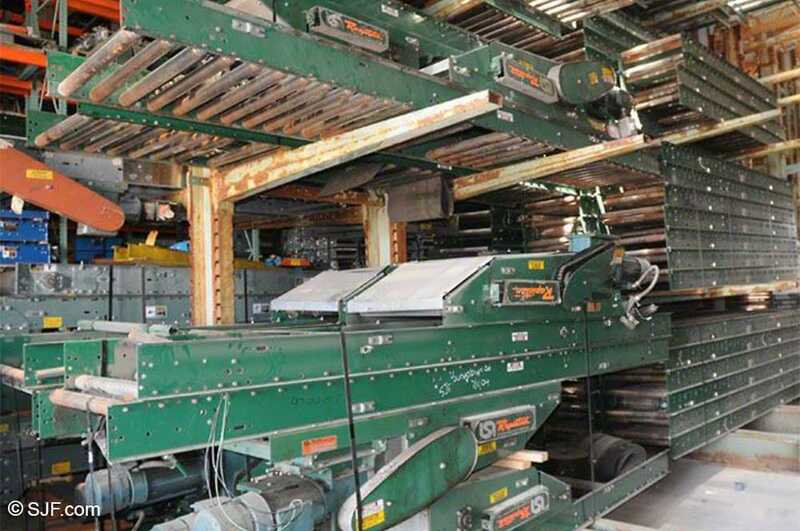 Buschman 9' x 23.5" OAW BOR drive, incline, feeder and straight drive $1,150.00 ea. $1,550.00 ea. Rapistan Dematic 410 30.5"W BOR $26.00/ft. $38.00/ft. Hytrol 12'L x 34" OAW BOR drive $1,250.00 ea. $1,625.00 ea. Alvey 24.5"W, BOR, 1.9"-2" centers, 7/16" hex, 4.5" frame, 10' long with drive $1,450.00 ea. $2,450.00 ea. Alvey 24.5"W, BOR, 1.9"-9" centers, 7/17" hex, 4.5" frame, 10' long with drives $1,450.00 ea. $2,450.00 ea. Alvey 26.75"W, BOR, 2.25"-6" centers, 5" frame $25.00/ft. $35.00/ft. 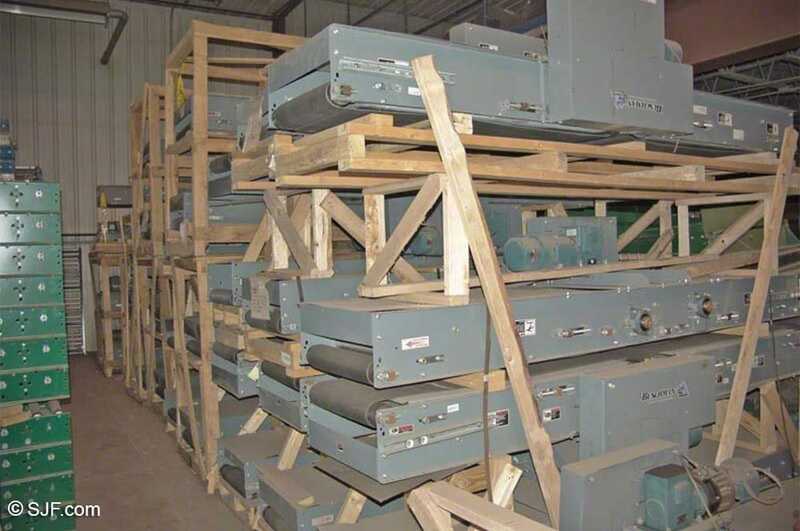 ASCI 30"W, BOR, 1.9"-6" centers, 7" frame, assembled units $26.50/ft. $38.00/ft. Buschman BOR feeders, 18.5" OAW, 4'L $5,145.00 ea. $800.50 ea. Buschman 23.5"W, BOR tails $595.00 ea. $850.50 ea. 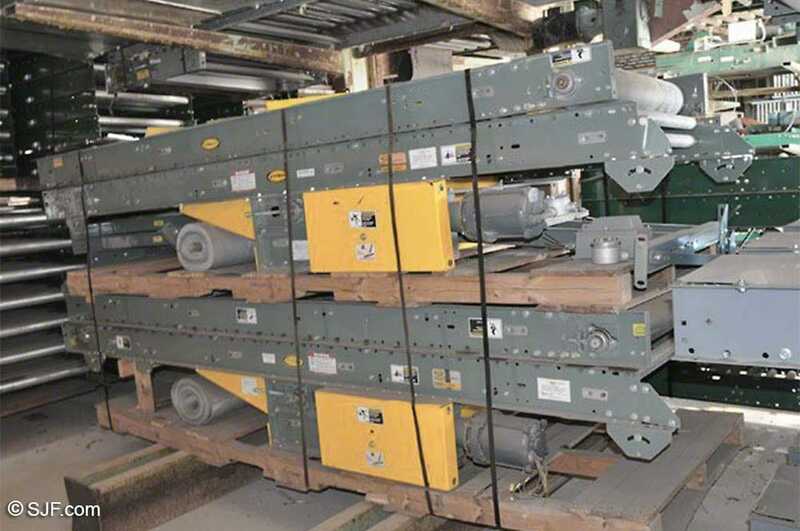 Buschman gap belt, 18-1/2" and 24-1/2" OAW, 10' and 15' OAL $1,770.00 ea. $2,400.00 ea. Buschman 23.5"W, BOR, 1.9"-8" centers, 5" frame $23.50/ft. $34.00/ft. Buschman 24.5"W, BOR, 1.9"-6" centers, 6.25" frame $23.50/ft. $34.00/ft. 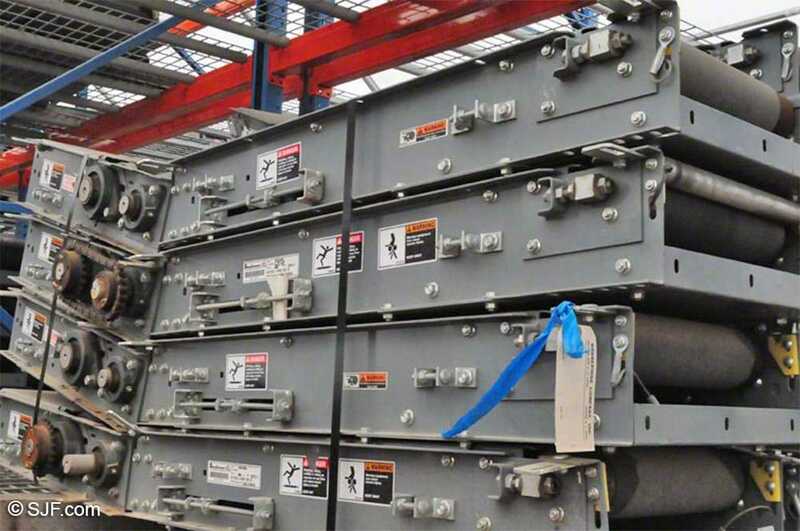 TGW Ermanco 21"W BOR drives, assembled on a 10' section $1,150.00 ea. $1,250.50 ea. Hytrol 24"W BOR, 1.9"-3" centers, 6.5" galvanized frame $24.00/ft. $30.00/ft. 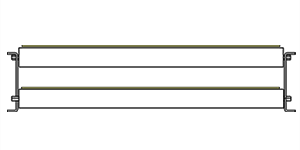 Interlake 21"W BOR, 1.9"-6" centers, 3.5" frame $22.50/ft. $28.00/ft. Motion Corp 24.25"W BOR, 1.9"-3" centers, 5" frame $25.00/ft. $30.00/ft. Rapistan Dematic 23.5"W BOR, 1.9"-8" centers, punches for 4" centers, 5" frame $25.00/ft. $30.00/ft. 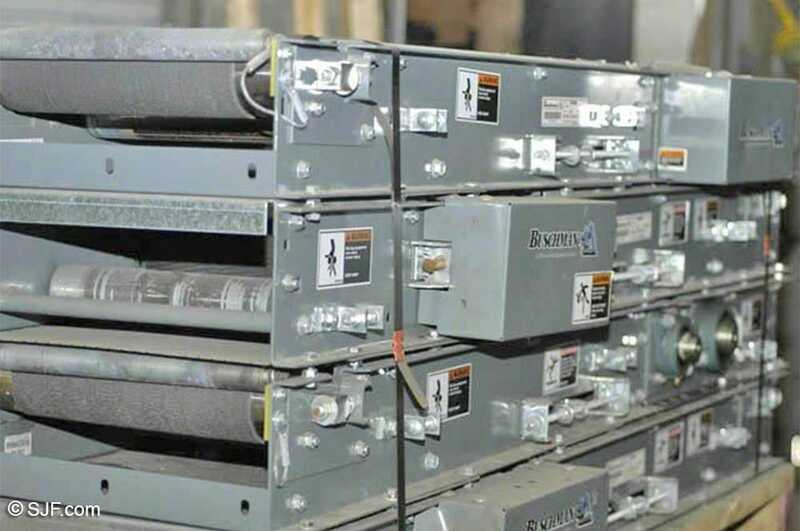 Rapistan Dematic 2-to-1 BOR sawtooth merge, 1.9"-3" centers, 24" incoming lines, 30.25" main line $5,950.00 ea. $8,000.00 ea. Rapistan Dematic 3-to-1 BOR sawtooth merge, 1.9"-3" centers, 24" incoming lines, 30.25" main line $9,950.00 ea. $14,000.00 ea. Versa Ferguson 27"W BOR drive frame, 1.9"-9" centers, 7.5" frame, no drive $25.50/ft. $32.00/ft.